They were some of the rising young men of Bowling Green, the twenty-something sons of bankers, lawyers and merchants. 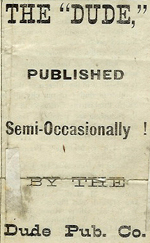 About 1883, some of these society swells decided to launch a journalistic venture “in the interest of the vast number of dudes of our city.” The product, the Park City “Dude” (Bowling Green, Ky.: Dude Publishing Co.), sought to entertain its readers with humor, anecdotes and parody, the chief objects of which were the “dudes” themselves. 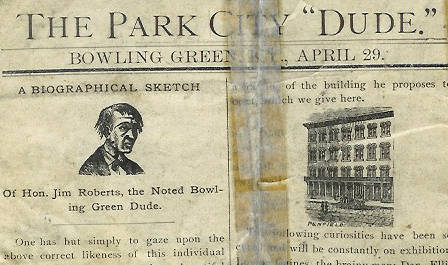 The Park City “Dude” can be found in the Lissauer Collection, part of the Manuscripts & Folklife Archives collections of WKU’s Department of Library Special Collections. For more, search TopSCHOLAR and KenCat. Comments Off on Park City, Dude.